There was never any doubt where Geraldine Bassett's Polar White 1968 Cat would end up, DCC member Erin Monfort says. "I wanted this car from the first day my aunt drove it home new when I was 10 years old," says Erin, the club's events coordinator. "I thought it was the coolest car I'd ever seen." Bassett, Erin's aunt, bought the car new in March 1968 in Hollywood, Fla. Thirty years after she first laid eyes on the Cougar, it became Erin's kitty. The car sports a beautiful red interior optioned with air conditioning and power steering and powered by a 302 V-8 and C4 automatic transmission. 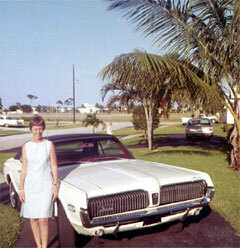 Geraldine Bassett, shortly after she bought her Cougar, in this March 1968 photograph. "It was always in the garage when she lived in Ft. Lauderdale," Erin said. "She parked it right outside of the front door entrance at her job as a switchboard operator at Chris-Craft Boats in Pompano Beach, Fla. But most of all, she loved to get in the car and go places. She made several trips between Florida and Maryland to visit our relatives. "After my grandmother passed away in 1976, my aunt chose to move back to the Baltimore area and, after the sale of her condo, packed the Cougar and headed north. She never drove the car in the snow. She didn't have a garage at her apartment, but she did have a couple of maintenance workers at the complex that would wash and wax the car for her on a regular basis—she did not want a dirty cat! She used to have people drive up next to her and honk their horns to get her attention and give her the thumb's up or talk to her about how nice her car was. She even had a couple of very lucrative offers to sell the car but she told them they would have to fight me for the car (I was with her once when this happened)." When Erin's husband Jim retired from the U.S. Navy in 1997, they moved back to Maryland, and once again close to Erin's Aunt and her Cougar. "My Aunt was 74 years old and had not been driving the car much. She was also legally blind in one eye and decided that instead of the car only being driven when I came to Baltimore to see her, it was time for her to give up driving and give the car to us so we could start the restoration. This was an extremely hard thing for her to do—giving up this independence meant that she had to rely on others to take her where she needed to go." The car was well cared for by Erin's aunt. But 30 years will take a toll on any car, and Erin and Jim decided the car deserved a detailed restoration. It was stripped to bare metal and repainted in its original color. A new vinyl roof and headliner, new front passenger floor pan, new carpet, new front seat covers and a lot of detailing with original replacement parts brought the car back to like-new condition. Thanks to eBay, keeping their ears out for bits of information and the DCC connections, they were able to find the parts that have added to the originality of the car. Their best find was a set of N.O.S. hubcaps bought for $25 each. "We included my Aunt in all of the restoration done to the car, including a visit to the man who stripped and repainted the car in Southern Maryland," Erin said. "We decided to re-create a picture taken of her (and me!) with the car on the day she purchased it, with her standing next to the car, just like that day in March 1968. In fact, several times I drove the Cougar to Baltimore to take her out to lunch so she could feel like the car was still a part of her." Sadly, Erin's Aunt passed away in 2006. Since the restoration was completed, the Cougar has taken many awards and scored very well in detailed judging at Cougar Nationals, including two first place trophies. Erin and Jim towed the cat to the East Coast Cougar Nationals several years ago in Atlanta. To prevent damage to the transmission, Jim disconnected the driveshaft. Once they arrived in Atlanta, Jim reconnected the driveshaft and they headed to the show location to go through the inspection. "One mile into the drive to the show site, the car began shaking violently," Erin says. "Then we heard a dragging noise. The drive shaft had fallen off the car in the middle of a busy road. "The police showed up and demanded that we move the car out of the road. A young cop who apparently had no idea what it was like to move a classic car without power steering off of a busy 6-lane highway—he had absolutely no sympathy at all and not once offered to help! It took about two hours to get the tools and get it fixed, and we made it to the show inspection 15 minutes before it closed!" Fortunately, there wasn't any damage from the mishap. Erin and Jim baby the Cougar, keeping it nice for shows and the occasional weekend drive from their home in Brandywine, Md. Jim is more than willing to talk to anyone interested in restoring their Cat, providing information on what he found useful and where not to go. Erin is senior manager of direct response with the National Foundation for Cancer Research, managing all print production for the foundation, with an emphasis on direct mail. Erin and Jim also own a 1969 standard Cougar coupe with a rare bench seat (Erin's) and a 1965 Mustang convertible (Jim's). 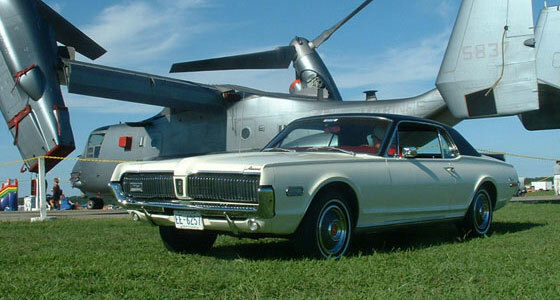 Erin says her '69 Cougar was originally owned by Martinsville Speedway…but that's a story for another day.